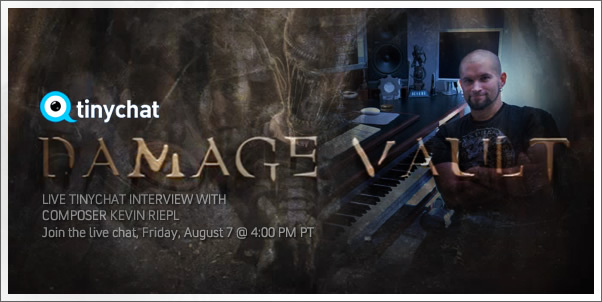 Join us FRIDAY, AUGUST 7, 2009 at 4:00 PM PT (7:00 PM ET) for a live, video, interview and chat with composer KEVIN RIEPL (GEARS OF WAR, UNREAL TOURNAMENT, HUXLEY). He will be sharing about his brief trip to this year's Comic Con (from a composer's perspective) and some of his latest projects including the upcoming game ALIENS: COLONIAL MARINES and the mysterious DAMAGE VAULT project. We'll take questions in the chat room, so come ready to fire away!